"Pan-Indian restaurant and Soho institution, Carom (www.caromsoho.com), is triumphantly returning to the London dining scene after a fire on Wardour Street temporarily closed the venue. 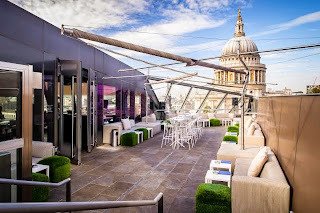 The restaurant is partnering with Madison London (www.madisonlondon.net) to host a sky high pop-up on the 6th floor rooftop of One New Change in St Paul’s. The menu includes a selection of light bites and larger plates, including King Scallop Roasted in Shell with Pepper & Chilli, Chicken Winglet Lollipops with a Goan Dip and Carom’s Signature Chicken Biryani."